The people will decide whether the Panama affair is case closed or not, the Prime Minister said this morning, 24 hours after making no reference to it in a meeting for Labour supporters. Describing yesterday’s attendance for the Workers’ Day meeting in Valletta as a show of support to the government, he reiterated that he will shoulder responsibility for mistakes by working harder. He was coy when asked for his reaction to former Labour secretary general Jason Micallef’s Facebook post on the “untouchables” who dampened the Workers’ Day celebration. 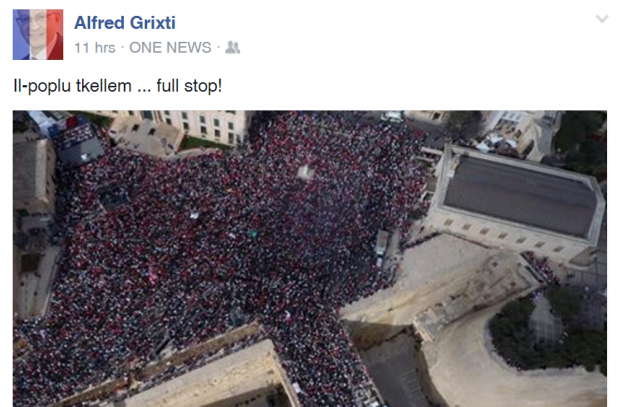 The comment was a direct reference to Konrad Mizzi and Keith Schembri, the Prime Minister’s chief of staff. “Jason Micallef, like many people, is genuine in his thoughts. Yesterday people were resolute to celebrate Workers’ Day after a difficult period we passed through as a party,” Dr Muscat said. Meanwhile, Education Minister Evarist Bartolo said in a Facebook post today that he considered minister Konrad Mizzi and Labour whip Godfrey Farrugia as colleagues and they shared mutual respect. He said they all wanted to continue to work together for the good of the people. Dr Farrugia on Saturday said he would not attend the party's workers' day meeting. When asked, he did not confirm that after his Cabinet reshuffle, some Labour MPs had informed him they were not interested in contesting the next election.